When Amsterdam is fast asleep, THE BUTCHER connects the city’s nighthawks and early birds in THE BUTCHER Social Club. The brand-new concept of the renowned Entourage Group is a 24h-juncture of great food, new music, edgy creativity, metropolitan lifestyle, and urban design. Situated in- and outside of Amsterdam’s newest mash-up of urban style, the A’DAM tower, the famous THE BUTCHER brand gets an unequalled twist. THE BUTCHER Social Club is a full-service playground for urbanites, open from 8 AM until far after midnight and all around-the-clock on Friday and Saturday. All bloody delicious day, all bloody delicious night. In the heart of the newest crossroad of innovation and lifestyle, The A’DAM Tower and the Sir Adam hotel, Yossi Eliyahoo creates connections among strangers with THE BUTCHER Social Club. ‘People connect on all levels, yet most of the times it includes either food, music, games or art. THE BUTCHER Social Club combines all these uniting elements in a high-end 24h-concept of casual quality.’ A renowned concept takes on a new form. And it’s bloody delicious. THE BUTCHER Social Club transforms an established brand into a connective place with an international charisma. The concept unites people as an easy-going coffee spot, a business centre, a casual restaurant and bar, and unexampled after party hangout with live DJ music. An urban lounge fused with a famous burger bar and an old school video game hall offering hours of gameplay with football tables, Ping-Pong tables, pool tables and pinball machines. Before dinner, after dinner, pre-clubbing, or when nocturnal cravings kick in, that is. Because THE BUTCHER Social Club never stops. THE BUTCHER SOCIAL CLUB BECOMES THE HOME OF MUSIC. 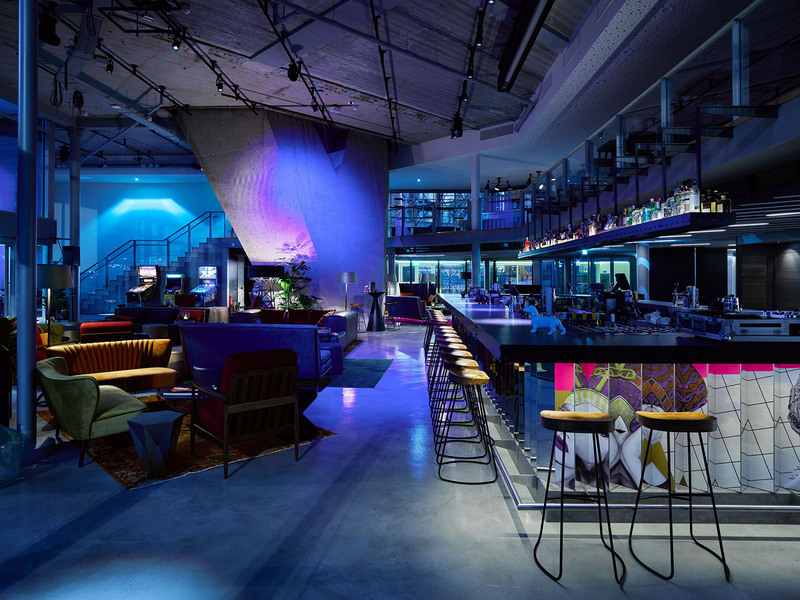 The 360-degree bar hosts live DJ’s five nights a week. Inspired by the location of THE BUTCHER Social Club, innovation & design studio ICRAVE from New York added an urban edge to the THE BUTCHER house style. Industrial materials are combined with lots of concrete and colourful artworks. A large, cosy lounge acts as a playground for adults, while seats spread throughout THE BUTCHER Social Club create a spot to enjoy an intimate drink. Hungry guests line up for the hole in the wall service counter where burgers can be ordered. When the sun has set, hundreds of people unite at the banks of IJ-river on the spacious terrace facing the water. From the first cup of coffee of the day till the last cocktail before heading back home through a city that slowly starts waking up; the bar of THE BUTCHER Social Club takes the ‘all day concept’ to a whole new level. Whether it’s a late breakfast, a tasty lunch, a glorious dinner or a midnight snack, THE BUTCHER Social Club satisfies each craving with bloody delicious dishes. The Morning Glory menu features breakfast favourites like poached eggs on sourdough bread, a stack of pancakes or the English breakfast on a bun. The lunch and dinner menus contain all THE BUTCHER classics, like the famous Angus beef burger, the ‘Silence of the Lambs’, ‘THE BUTCHER’s Wife Favourite’ chicken burger, ‘The Ugly’, and ‘The Veggie Delight’, as well as exclusive THE BUTCHER Black Book dishes like the ‘Beef Steak Pie’, ‘Mama’s Meat Balls Sliders’ and the ‘Beef Tacos’. And, because dinner is never truly fulfilling without some dessert, THE BUTCHER Social Club offers sweet ‘Happy Endings’. With perfect thirst quenchers for every hour of the day, THE ENTOURAGE GROUP’s signature 360-degree island bar is an epicentre of the high-quality drinking culture. The menu includes THE BUTCHER’s milkshakes, morning smoothies, undiscovered and exclusive beers from all corners of the world, a solid wine menu, a high-end selection of spirits, and signature cocktails fitting for the after-party spot of Amsterdam. Intoxicators on the cocktail menu range from classics with a THE BUTCHER twist such as ‘THE BUTCHER’s Negroni’ and made to measure concoctions like ‘THE BUTCHER Tea’. Since 2012, THE BUTCHER has been shaking up Amsterdam by serving the best bloody burgers in town. Haute fast food is prepared on the spot with only the freshest of ingredients. The relaxed atmosphere of THE BUTCHER and the professional service level have made the burger bar the place for a cool yet relaxed meal out. True to their name, the “butchers” in the kitchen exclusively work with the best quality Aberdeen Angus beef. From the best meat to the selection of herbs, the fresh vegetables, the special signature sauce, right down to the homemade semi-brioche bun. 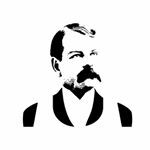 THE BUTCHER constantly commits to creating the best quality burgers.  Along with THE BUTCHER Social Club, THE BUTCHER brings this ambition into practice with THE BUTCHER Albert Cuyp, THE BUTCHER West, food truck THE BUTCHER on Wheels, THE BUTCHER Berlin, THE BUTCHER Nine Streets, THE BUTCHER Ibiza and the upcoming THE BUTCHER Milan. With THE BUTCHER Social Club, THE BUTCHER wishes Amsterdam a bloody delicious morning, a bloody delicious day and an even more bloody delicious night.